Get yourself a custom iPad Air 1 smart cover to protect your screen from any damage. High quality, scratch resistant photo printed on the back. Can be used as protective case and stand. Optional smart case for the back! The smart cover from GoCustomized is a flexible cover for the front of your iPad Air. The cover can be rolled up which therefore works as a protective front and a handy stand for your iPad. In addition, the smart cover helps in reducing battery usage by making your iPad Air go into sleep mode as soon as the cover is closed. The smart cover is attached to the side of the device by use of magnet. If you would like to protect the back of your iPad Air as well, we advise you to purchase one of our back covers. These two products can be combined to make the perfect iPad Air case. How do I design my own case? 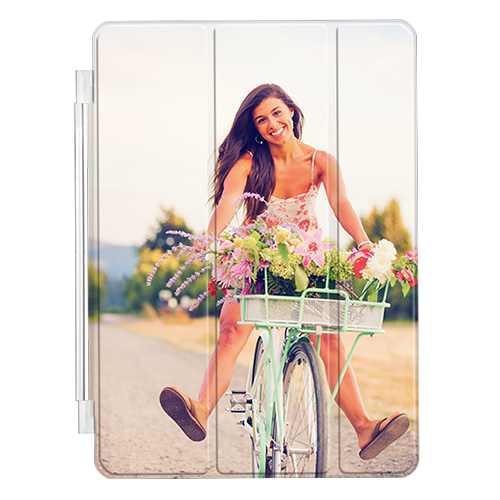 Here at GoCustomized you can design your own iPad Air case by using our specially developed design module. You start by selecting which iPad Air version you have, followed by the decision to purchase the smart cover alone or in combination with the smart case. Once this choice has been made the fun can begin. Start by uploading one of your favorite images, pictures, patterns or pre made designs. You can position your personal design however you please. We are able to print on the entire surface of the iPad Air smart case. Don't forget to add some text using our text module. There are plenty of fonts and colors to choose from! The smart cover is attached to the iPad by use of magnets which are situated on the side of the cover. The magnets attach to the side of the iPad. This makes it easy to open and close the smart cover. Due to a magnet placed on the inside of the smart cover, you iPad will automatically go into sleep state when the case is closed. This ensures you have an extended battery life of your iPad Air. Looking to protect your iPad all round? Then a combination of an iPad Smart cover and Smart case would best suit you. Combing these two products creates the perfect iPad case.